Home to the NFL Buffalo Bills, Ralph Wilson Stadium opened in 1973. Built at a cost of $22 million, the stadium has a seating capacity of 73,079. Affectionately called “The Ralph”, it is named after the owner of the Bills, Ralph Wilson.. 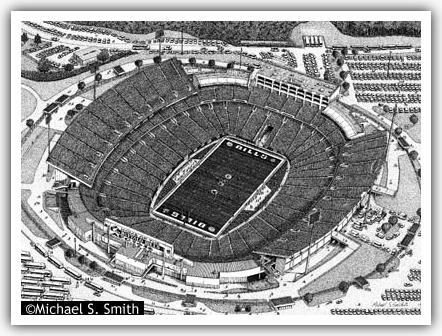 This drawing depicts the stadium prior to the renovation in 2000. To view a version of the stadium as it appeares today, CLICK HERE.